I got a very nice surprise earlier this week. I'd asked my Mother to keep an eye out at the auction she and Dad visit each week, for some baskets for our farm stand this summer. Yard sales, auctions, and flea markets are great places to find nifty items that can be repurposed without breaking the bank. I want to use them to hold the fruits and veggies we'll have to sell. Mom found several baskets for me. Overall, the ones she chose were all suitable and nice, but a couple of them really stood out as something special. 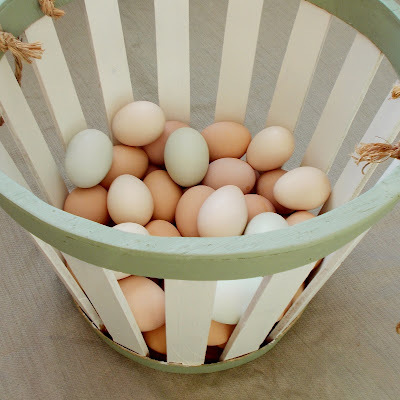 I knew immediately that I had found a fantastic new egg basket, when she showed this one to me. A little paint (left over from last summer) and less than an hour's time invested, and I ended up with this! Usually, I leave items "as is" because I think it adds some character. This basket had had its nail holes covered over with white putty, but it's creator had not finished it beyond that. 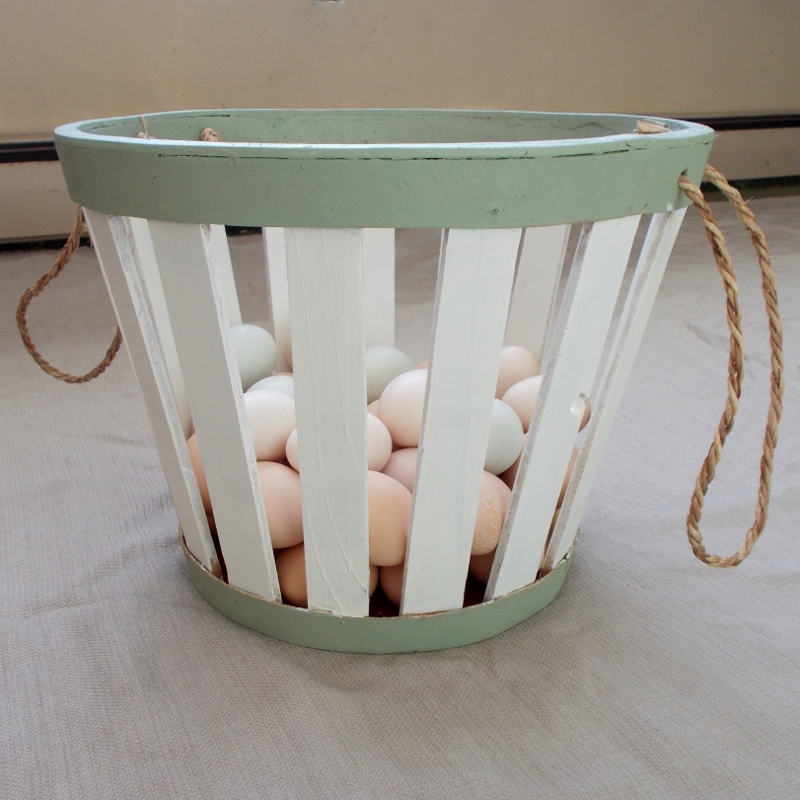 I know how much use this little basket is going to get, coming with me each day, rain, snow, or shine to collect our hen's eggs. I thought finishing it would be the best option towards keeping it intact for a long time. And, I must confess, I love how it came out! I was easily able to carry more than 3 dozen eggs at one time. When the hens are at full production this summer, that will certainly be handy! The weather has returned to near and/or below zero temperatures, which means extra hay and warm breakfast and mid-day meals for everyone. The animals are bearing the cold well, but I know we will all be much happier when the warm days return. We are counting down; 62 days until Spring officially returns to the north. While we are waiting, we are making good use of our time. Today, I made 2 new batches of soap: Maine woods and a new scent I am trying Apple Rose. Tomorrow, Sean and I are making 4 more batches: Lavender, Cinnamon, Vanilla, and Citrus-Mint. These will all be cured and ready for use in about 4-5 weeks (Mid-February 2013). I, also, spent some time designing labels for our egg cartons. According to the MOFGA website, in Maine, we do not need to register with the state to sell our hen's eggs if we raise less than 3,000 laying hens. Our 50 hens falls significantly short of that level, but our labels do need to contain information detailing: our name and address, the grade, size, weight and count, and safe handling instructions. I'll probably fiddle with it some more, but it will do for now. Lastly, I had mentioned a while ago about us ordering our non-hybrid, non GMO, organic seeds for this year's garden. We are combining orders with some local friends in order to enjoy a discounted price. For any of our local friends who want in on this deal, the order is going to be placed on January 26th. You can browse the Fedco online catalog. Please, contact me with your order and payment. We anticipate our seeds should be received approximately 2 weeks after the order is placed. I think it is time for us to review our garden plans to make sure we are ready for the upcoming growing season! So beautiful! A perfect egg basket just in time for the coming spring and summer months!! I'm a big fan of that egg basket...and the eggs are beautiful. LOVE baskets too...have a fondness for them. =) They help organizing so much! The pictures of the eggs in the basket really make it come alive! Love it. Also liked the new labels. I wouldn't change a thing. What a cute egg basket! I love what you did with it and the eggs are so pretty! Those soaps sound wonderful, especially the Maine woods one. And I really like your egg label! I love the basket, and label. We finally got a taste of your weather down here, Ryan and Abby enjoyed a day off school and work on Friday. Yesterday however, I was on my way to the car and fell victim to some black ice, I didn't enjoy that AT ALL. I've been laid up in the bed mostly since. I will survive, but I am sure there will be lots of Epsom Salt baths in my near future. What a cute egg basket, and I love the paint job. Great job on the labels, too! 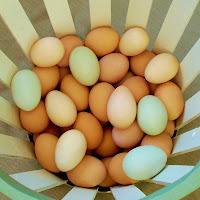 We're lucky in AL since eggs we sell at our farm don't have to be labeled, but if they ever start requiring it (& with how the state works, they probably will lol), you've given me great inspiration how to go about it. Have a great week!! !